Friday: Christ the King (CHSAA) 54, Benjamin Cardozo (PSAL) 51 (overtime); Long Island Lutheran (AIS) 68, Green Tech (NYSPHSAA) 52. Saturday: Christ the King 58, LOng Island Lutheran 52. Friday: Scotia-Glenville (NYSPHSAA) 70, Albany Academy (AIS) 57; Holy Trinity (CHSAA) 71, Washington Heights Expeditionary Learning School (PSAL) 65. Saturday: Scotia-Glenville 68, Holy Trinity 52. Saturday: Westhill (NYSPHSAA) 80, Dwight (AIS) 52; Regis (CHSAA) 52, Brooklyn Community Arts & Media (PSAL) 44. Saturday: Long Island Lutheran 63, Ossining 57. Friday: Cardinal O'Hara (CHSAA) 73, Pittsford Sutherland (NYSPHSAA) 65. • NYSSWA site for brackets of tournaments from the past and present seasons. 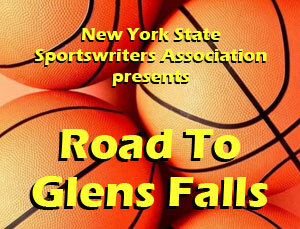 • Road to Glens Falls for scores and stats. • Road to Troy for scores and stats. • NYSSWA site for tournament brackets. Sunday: Cardinal O'Hara 76, Martin Luther King (PSAL) 47. Saturday: Utica Notre Dame (NYSPHSAA) 66, East Harlem Pride (PSAL) 37; Staten Island Academy (AIS) 57, Mount Mercy (CHSAA) 53. Sunday: Utica Notre Dame 67, Staten Island Academy 39. NOTE: The above schedule reflects a revision to two boys games on the original schedule. Friday's Albany Academy vs. Scotia-Glenville game was been flipped on the schedule with Christ the King vs. Cardozo.